Richard Croasdale talks to Lance Kabot of St Francis brewing about travel, pub culture and near-death experiences. When avid surfer Lance Kabot came off his board a few years back, it could easily have been the end for him; instead, it proved to be a new beginning. With five months in hospital to recuperate from a broken neck and a host of other serious injuries, Lance had the chance to really ask what he wanted from life, question what was important, and hatch a plan to combine everything he loved. In the 90s, Lance and his girlfriend (now his wife) did what so many young South Africans seem to do, and travelled the world, taking casual jobs, exploring, surfing and generally having an awesome care-free time. Lance found he loved working in breweries, and – having previously only experienced cold but bland lagers at home – was inspired by the amazing beers he tasted working for the likes of La Jolla Brewing Company in San Diego, California. Their travels also took them to Edinburgh, where a stint at Caledonian brewery taught Lance the delights of traditional British ale, and to London, where he developed a taste for cask. Not only did he love the beers and the craft of brewing, Lance was also fascinated by the unique pub and bar cultures he found in each of the places he visited, and in particular the phenomenon of the brewpub. Laying in his hospital bed over a decade later, feeling lucky to be alive, Lance brought back all these happy memories, and a plan began to galvanise around them. A mere six months after the accident, Lance had a board back under his feet and a vision to bring home everything he’d learned on his travels, creating his own US-style brewpub in the South African surf town of St Francis. St Francis Brewing Company opened its doors in December 2014, with a range of easy-drinking, flavoursome, sessionable beers straight out of the California playbook, with juicy North American hops perfect for the sun-loving surf crowd which converges on the town each summer. It was certainly a gamble, for the formula went down a storm. But Lance hasn’t stopped at his brewpub. St Francis is a big holiday town, and crowds from the neighbouring metropolises also developed a taste for the brewery’s somewhat unfamiliar style. While St Francis has been a hit with the classics, Lance says he is ready to start experimenting with different styles, and believes his customers are ready to go with him. 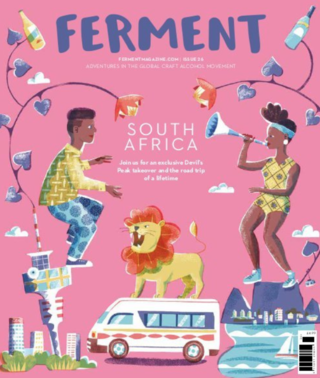 “We’ve always used mostly American hops, but I’d love to do some small batches with South African hops, particularly if we can get them fresh at harvest time. Devil’s Peak have also been showing us some stuff around sour beers, so that’s definitely something I’d like to try. We’ve got Fierce Beer’s tangerine tart on tap at the moment, and that’s amazing.